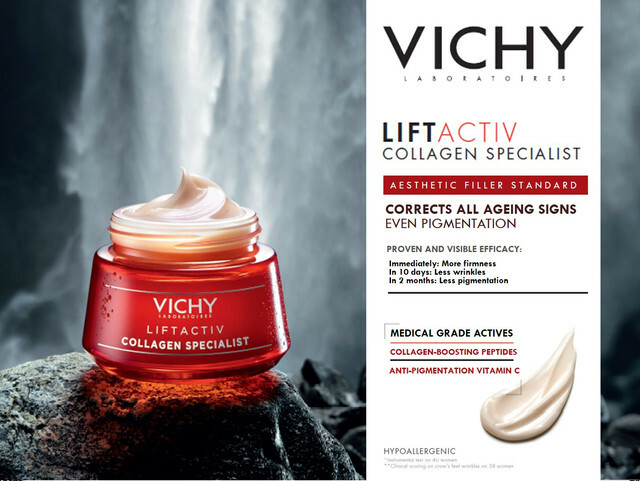 Inspired by the new generation of aesthetic procedures, Liftactiv Collagen Specialist antiageing cream is formulated to match aesthetic filler standard of correcting all signs of ageing, even pigmentation, with immediate to cumulative results. Tested with more than 1000 clinical measurements. 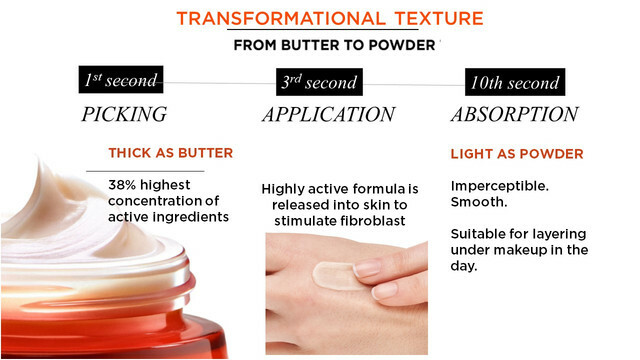 2) Upon application, active formula is released to penetrate and instantly smoothes your skin. 3) In 10seconds, soft, velvety touch suitable for layering under makeup in the day. *Instrumental test, 40 women age 40 to 65 years old. **Instrumental test, 52 women, age 450 to 65 years old. Have always like Vichy prod. Try this new prod for 10 days & indeed it 'lives up to its name'! Though it's more of cream based, it is quite light-weight upon application. After using it for around 10 days, found my skin has improved tremously- more firm & less wrinkles. Would definitely buy it when I have finished this bottle. Thanks 'Try & Review' team for giving me this chance to try this Great prod!!! Looking forward to more Great New treats from 'Try & Review' team! CHEERS!!! I'd tried the product for 10 days now and feel that the the cream made my skin feel hydrated and smooth, and the pigmentation on my cheeks seems lighter, I hope by continue using it it will getting more lighter. Loved the texture of the product, as my skin is oily and sensitive, and although this is a cream texture, it absorbed right away, smoothened my skin instantly like a make up primer, and over time, I felt my skin firmer. The cream also has a very nice scent, and it didn't aggravate my skin at all. Overall, very good product, and I would definitely purchase again once this is over! This product is such a bomb to my daily facial care routine. Have used this product for a week now and the improvements keep on exceeding my expectations. It has that sweet-soft powdery scent that you may find a little extra but will fade away once applied on the skin. Also, it has that creamy texture but never greasy at all and keeps your skin soft, smooth and moisturized. My skin type is on the oily-combination type, nevertheless, when I used this product, my skin stayed hydrated yet oil-free and smooth all day long. We are not getting any younger, so taking good care of our skin is really a must do for every woman. This product really impressed me that it helped to decrease those freakish visible lines that every woman hates to see and it gives a high concentration of quality ingredients that helps to improve the firmness of my skin. To my fellow ladies, always remember, looking young and staying young is our simple reward to give to ourselves.